We answered GODcha’s 1st LEARN/LIVE Question. We want to HEAR God Speak and answer GODcha’s 2nd LEARN/LIVE Question. Lord, thank you for this book, for this first verse. Remove anything that would get in the way of us hearing You speak today! 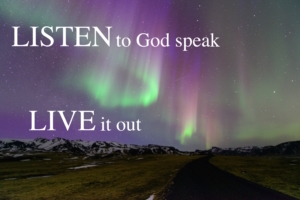 May we have ears to hear and eyes to see! Meet us in this time as only You can! Thank you. introduced himself as a bond-servant of God and the Lord Jesus Christ. The Lord is always speaking. . .
but DID NOT believe that Jesus, his brother, was who He said He was. James understood and knew full well what dead faith was! Am I full of unbelief, NOT believing Jesus is who He says He is? James, the unbelieving brother of Jesus, came to true saving faith, convinced that his brother, Jesus, is the Christ! Now, introducing himself as a bond-servant of God and Jesus. Have I come to true saving faith? Am I convinced Jesus is the Christ? because he was given the leadership role in the church. How has my belief changed me? What role has God given me in His church? God and Jesus were his Master. Followed and lived for Christ. Willing to obey and do God’s will from the heart. Have I made a choice out of love for all God has done for me to be: a slave, a servant, and submissive? How am I serving God and Jesus? What must I do to deny myself and follow Jesus? How is my devotion to God and Jesus seen? Who am I living for? God, OR me, myself, and I? 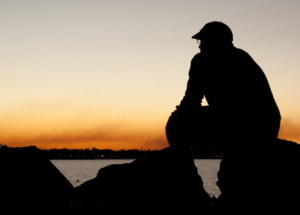 Have I come to a place where I am willing – sold out to do the will of God? Everything in the book points back to the purpose – being a doer of the Word. THINK: How all these characteristics show that James is living his faith as a doer of the Word. James introduction is about being a servant. Is title important to me? Do I desperately want and need to be recognized? Do I flaunt who I am, what I do, and/or what I’ve done? Am I a name dropper? Or, am I just okay with being known as a servant? 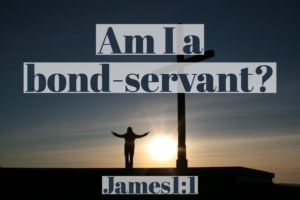 Am I a bond-servant of God and the Lord Jesus Christ? and will never leave us or forsake us, (Heb 13:5). Did you ever imagine you could learn so much from 1 little verse? There is so much to digest, isn’t there? 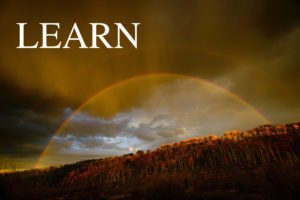 Meditate on all the Lord has taught you, for it pleases Him. Be glad in Him, (Psa 104:34). And the Holy Spirit will bring all that entails to your recall! Also enter the personal things God has touched you with. Take What We’ve LEARNED and Turn It Into a Prayer. 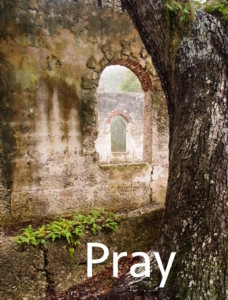 OH HEAVENLY FATHER, AND BLESSED LORD JESUS, OUR MASTERS, and HOLY SPIRIT – GOD in three persons, we praise You! Thank you so much for Your Holy Word. Oh, Father our hearts are filled with gratitude for all You have done for us. Nobody can love us as You have, sending Your one and only Son to purchase us and set us free from sin. You have loved us, provided for us, been kind to us, and helped us. Oh, sweet Jesus You humbled Yourself, becoming a servant, unto death on the cross for us. Oh, why wouldn’t we want to be bound to You as Your slave? Thank you for James, who turned from unbelief to true saving faith, becoming Your bond-servant. May these wonderful truths about being Your bond-servant stir us and sink down deep into our hearts and minds. Change our hearts oh God! Give us faithful, devoted hearts. May You give us the strength to deny ourselves daily, hourly, moment by moment. May You give us such a love for You and Christ that we will be wholly devoted to You with our lives, our time and our resources. Show all of us how to live for You and not ourselves. Show each one of us what our role is in the church, and how we can better serve You! Oh Father, we ask all these things in Jesus name, whose name is above all names! Amen! That’s it for today! You’re off to a fantastic start! 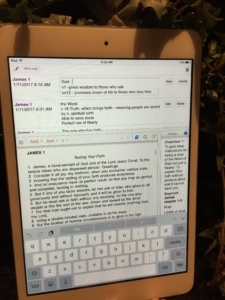 Thank you for joining in this discovery of the book of James. May you consider what a privilege to be bond-servant of the Lord. Meet you in a couple of days to unpack James 1:2-4 – True Faith Endures Trials.